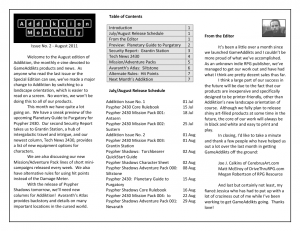 Addiktion is a monthly e-zine devoted to GameAddikts product lines and news. Mission/Adventure Packs highlights our weekly releases of mini-campaigns for both the Psypher 2430 and Psypher Shadows lines. Alternate Rules: Hit Points lets you replace the currently used Damage Meter in the Psypher RPG system with a Hit Point-based system. New issues of Addiktion are released on the 1st of every month! This title was added to our catalog on July 23, 2011.